Beolit 707 received radio programmes on FM, long and medium wavebands. 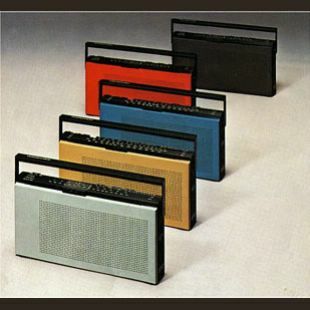 This portable radio was Bang & Olufsen's handiest music system. Its sound reproduction quality was so outstanding that it invites even critical music lovers to listen to music programmes when they are away from home. Power input was specified at a pure 1 watt and frequency range was 65-20 000 Hz: exceptional for a transportable radio receiver. A large tuning scale with thumb wheels made tuning easy. Bass and treble was adjusted separately and there was an AFC facility to keep FM stations correctly tuned. Beolit 707 could be plugged into the mains supply or run from batteries. The cabinet was finished in coloured Nextel - a synthetic material with a suede-like finish which is washable ands scratch-proof. 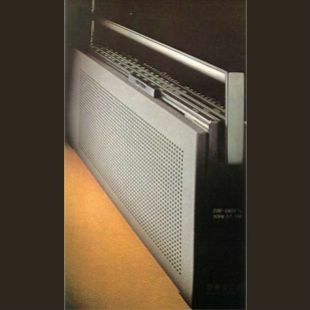 It was designed by Jacob Jensen, the same as its FM-only sibling, Beolit 505.